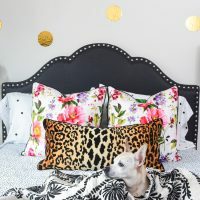 Room reveal day is here, and it is packed with affordable guest bedroom decor ideas that are easy. 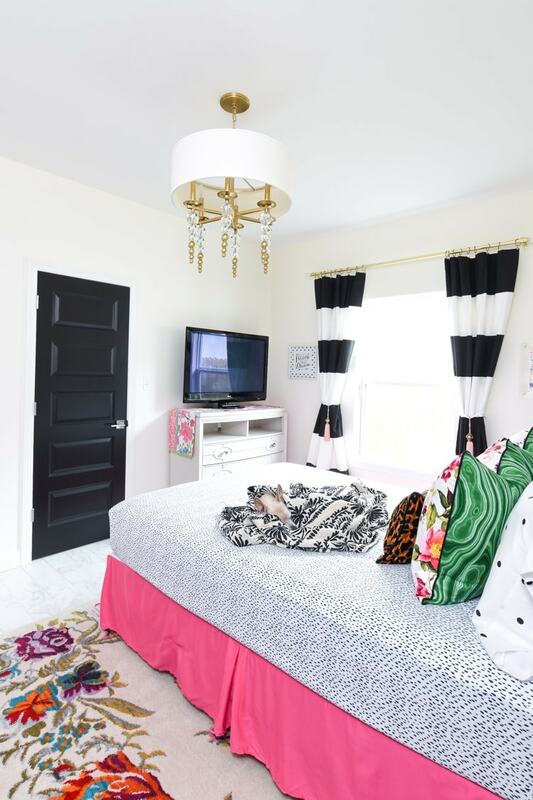 No paint, no fuss, no super major projects…this was truly a room refresh made possible with colorful decor and design accessories. Pee Wee basically refuses to not be with me during these shoots, so if you can’t beat ’em, put them in them in the photos. 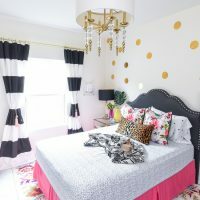 I’d like to give a huge thank you to my friend Stephanie from Casa Watkins Living for hosting the New Year, New Room Refresh or else I may have never gotten around to really doing something with the guest bedroom. 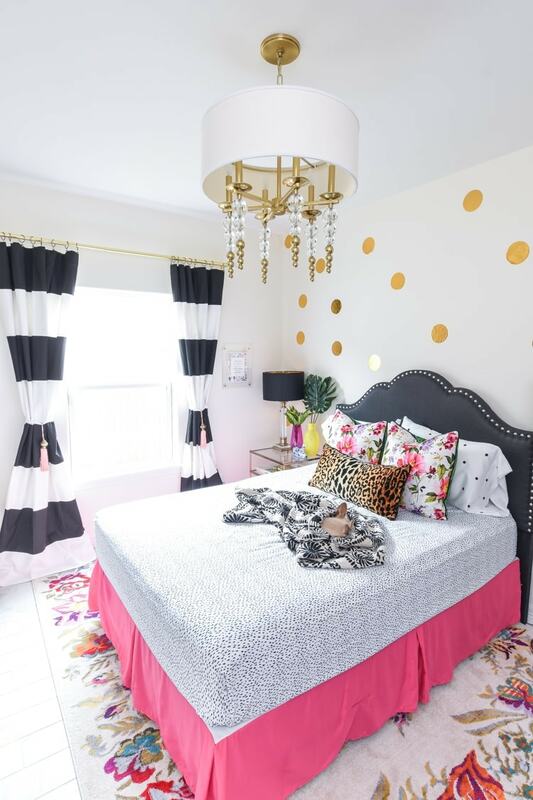 The inspiration for the guest bedroom decor was colorful, chic, upscale and FUN. 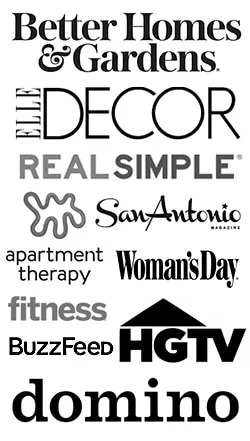 I know many create their guest rooms super calming, but that is not the case here! 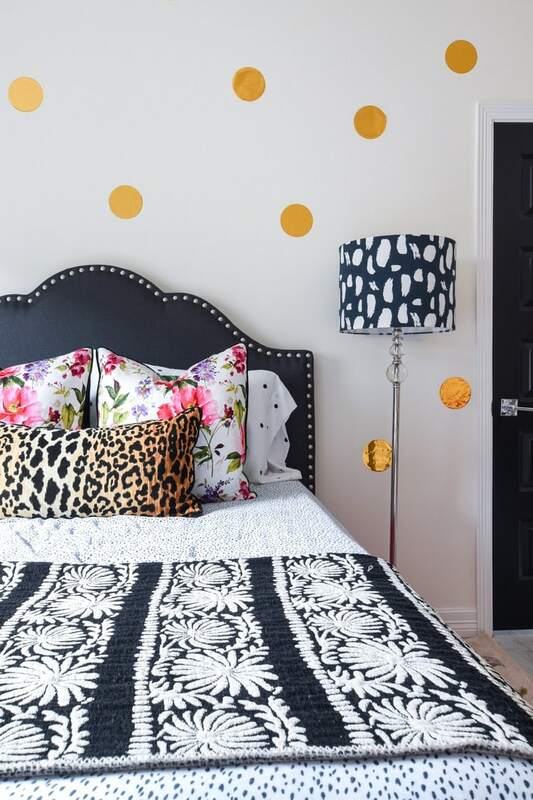 The biggest thing I wanted to NOT do was paint, so some five-inch vinyl foil polka dots randomly scattered across the wall created a fun, Kate Spade inspired vibe. A curvy charcoal linen headboard provides some contrast for the fun bedding I selected for the room. 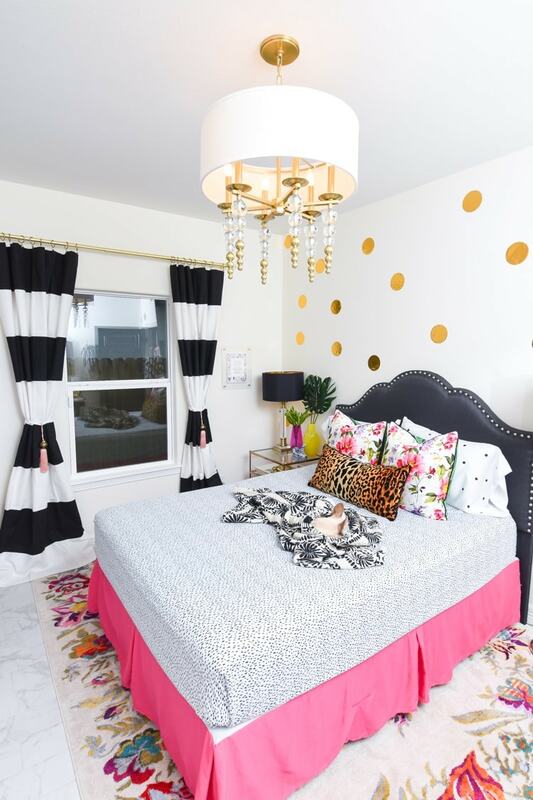 My favorite part is how the light bounces off the gold polka dots at various times throughout the day. 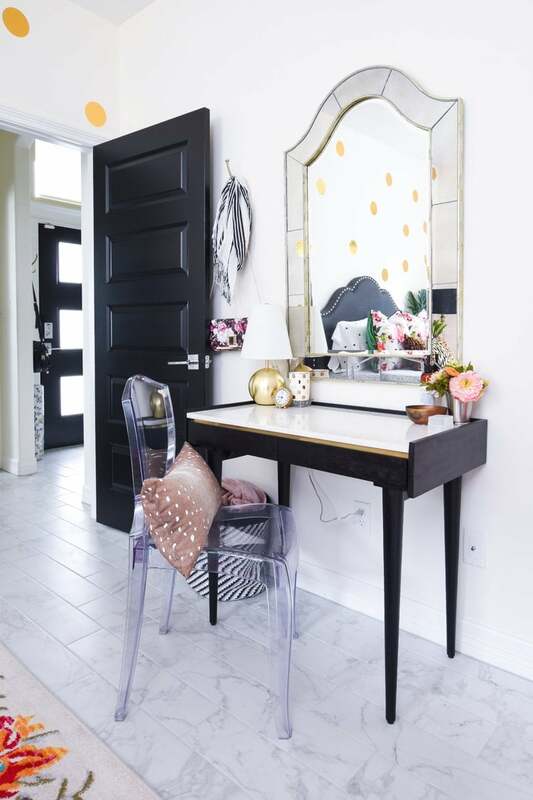 The black door also provides a break from the sea of white in the room. So. Much. Fun. If you want an accent wall that can go up in under half an hour, try something like what I did in this space. Easy and removable. 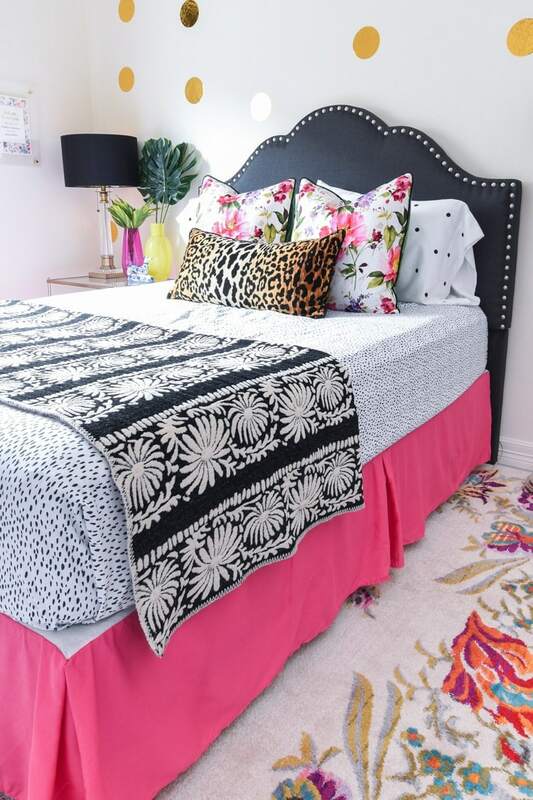 The bedding…I had a lot of fun pulling this eclectic, but curated look together. 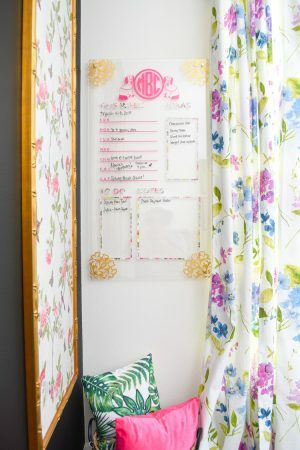 I SO wish these speckled sheets by Sabrina Soto were still available—these sheets have held up so well for almost three years. 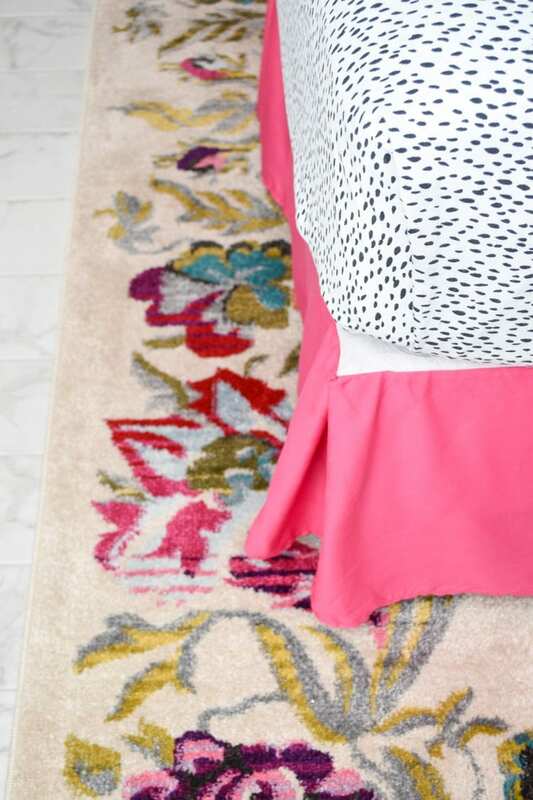 Going with a bold, hot pink bed skirt was an easy choice because of how much white is in the room, plus I wanted the bed skirt to complement the GORGEOUS floral rug provided by Home Dynamix and available for purchase here. 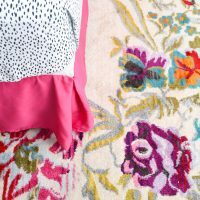 The floral rug is definitely one of the boldest I have ever used in my home, and I cannot stop gushing about it. 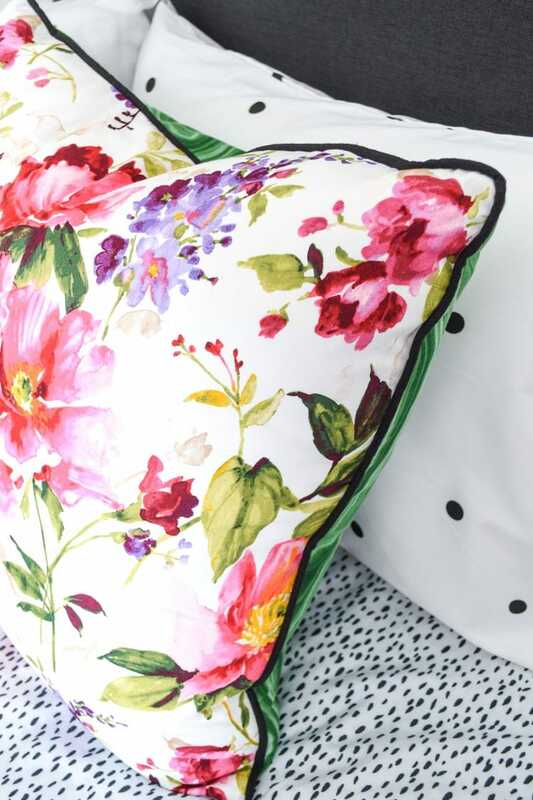 Loom Décor’s custom pillows are swoonworthy. They’re downfilled, bold, colorful, reversible and HUGE. I got honeysuckle floral on one side; green malachite on the other brought together with black linen piping. I went for luxe and large with my pillow choices to make the guest bed feel hotel like. 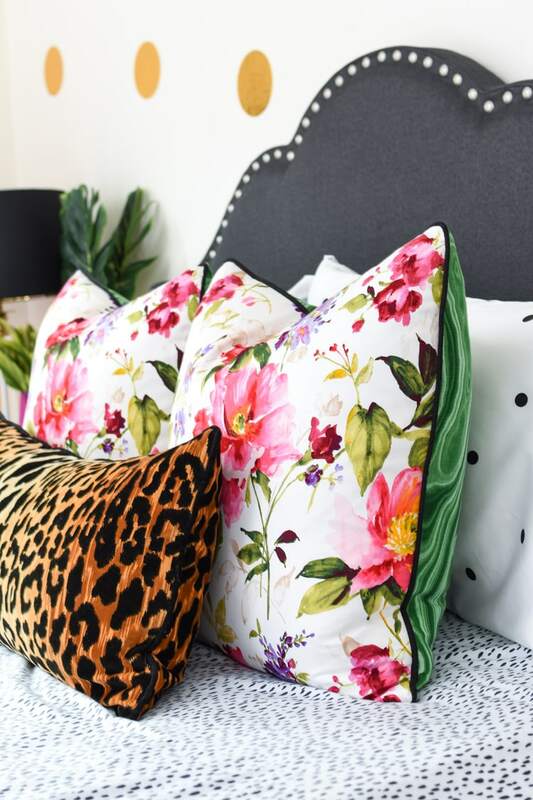 Loom Décor’s quality is outstanding, and I know we’ll love and use these pillows for many years to come. I have a white comforter for the bed that I omitted for the shoot because it’s much more fun this way. Rather than spend money on new furniture, I opted to reuse an old glass end table as a nightstand. 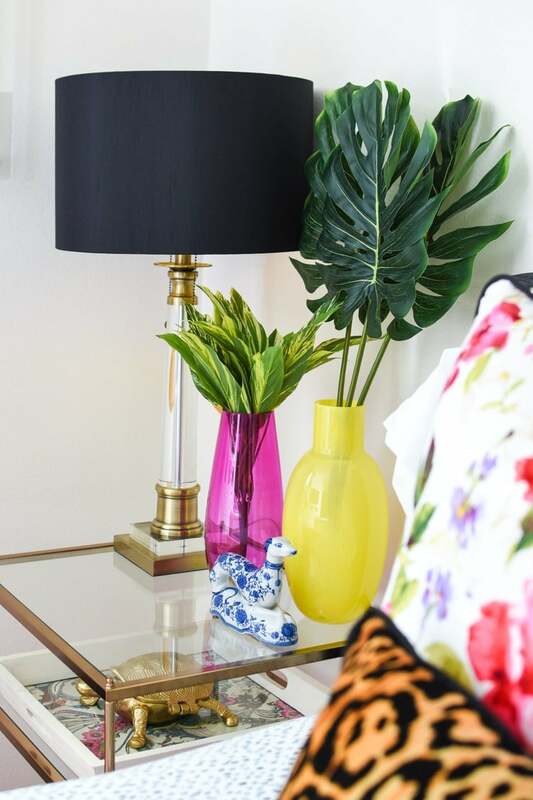 I decorated the top with a beautiful black and gold lamp, some greenery in colorful glass vases and a chinoiserie dog. On the middle shelf, I placed a turtle trinket box on a tray for guests to be able to stash their smaller items while they stay with us. The basket on the bottom will hold extra toiletries and such. Relocating the TV in front of the bed (while still having plenty of room to walk around) not only makes for a better TV viewing experience, it also allowed us to add in a desk where this media stand used to be. 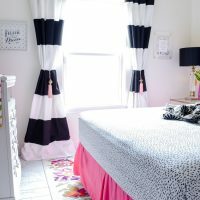 I love not having big bulky nightstands in here—while the room feels spacious, it definitely has quite a bit of furniture it for a small guest bedroom space. The lighting… I really cannot believe I have such a stunning chandelier in my home. It’s the Persis chandelier from Hudson Valley Lighting. I love how this legit looks like a boutique hotel light. And the gold AND the crystals… pure bliss. My electrician had zero trouble installing this and kept commenting how beautiful it was. He even took several photos to show his other clients! When the Persis chandelier is on, it casts a warm glow over the entire space. 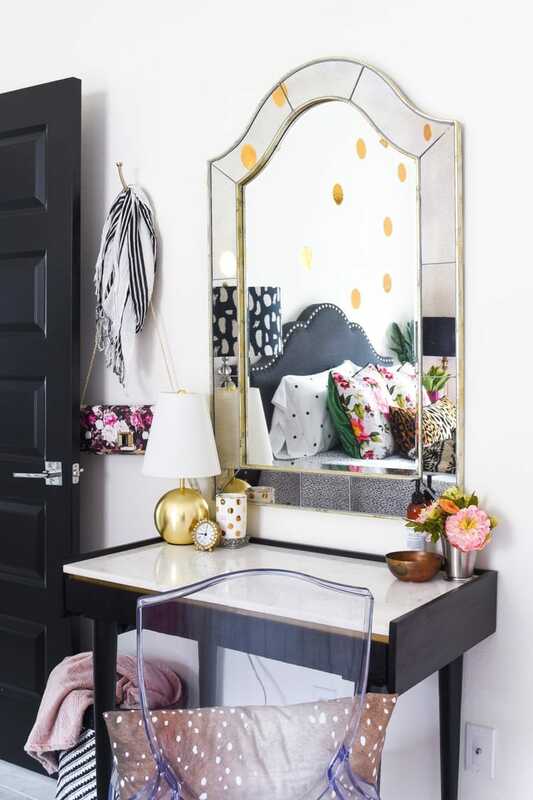 It’s the sparkly tiara that crowns this magnificent room refresh. I was a bit nervous about removing the ceiling fan, but we’ll likely place a fan in here for people (like me) who need the noise to sleep. 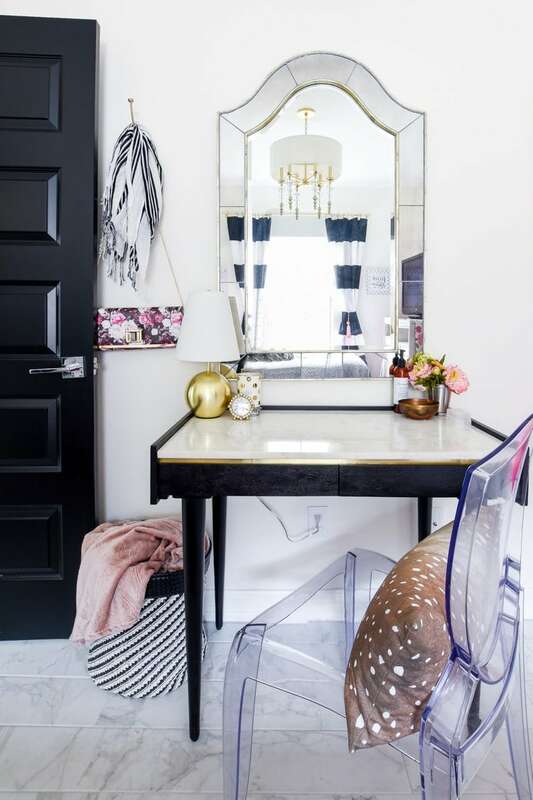 As mentioned earlier, we were able to squeeze a petite black, marble top desk in here. It has a marble top and a gold accent strip on top of two small drawers. My reason for wanting to add in the desk was to give Daniel a place to do his grad school work AND to add a vanity/desk for guests to use with their laptops or to prep in the morning. The ghost chairs were brought in to add extra seating, and since they’re virtually clear, they don’t feel heavy in the space. That mirror used to be in the foyer before we bought a new one last fall, and the way it bounces light around the room is dreamy. 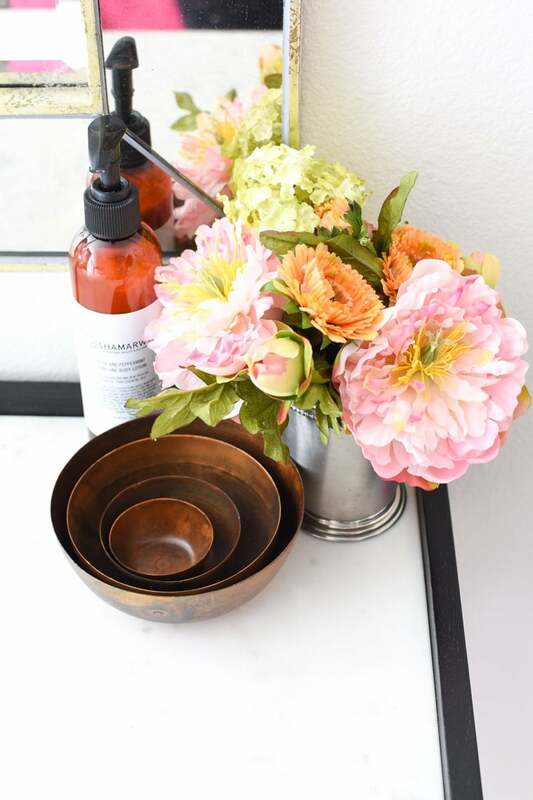 Faux florals next to the brass nesting bowls from Boho Luxe Home add some color to the desktop. I adore the patina on those bowls! 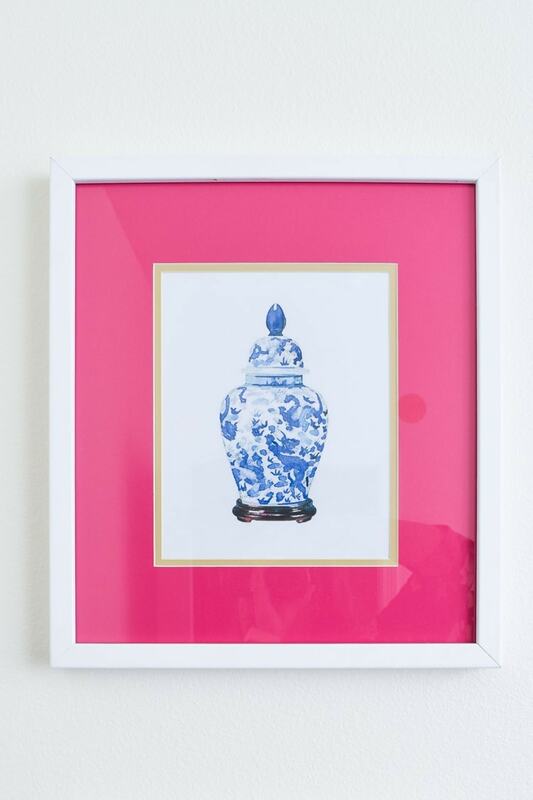 Some free printable ginger jar art framed in beautiful hot pink, gold and white custom picture frames from Art to Frames create the only gallery wall in the space. I love how my custom frames turned out, and the color pairing of pink, blue and white is always a no fail color scheme. These are the first thing you see from the door way, and I wanted that big jolt of color. 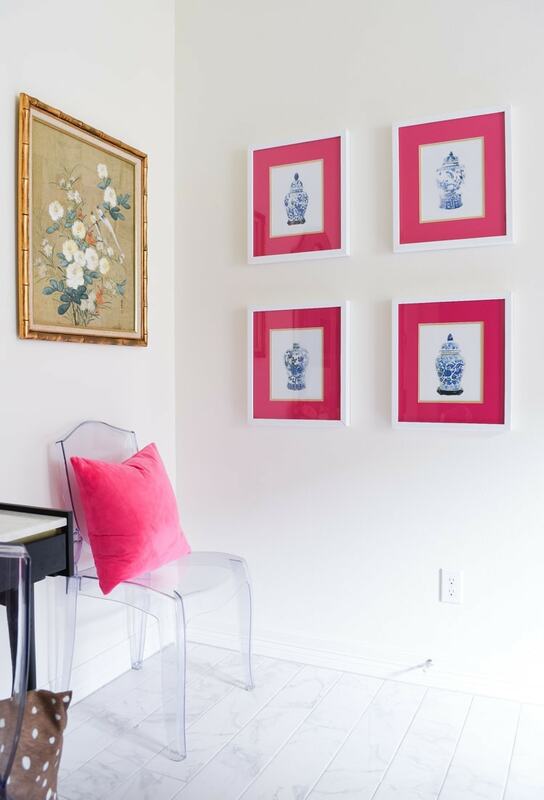 Adjacent to the gallery wall, I placed the other ghost chair with a hot pink velvet pillow below a chinoiserie art print I picked up at an estate sale last fall. I love how the birds and colors play off the other guest bedroom decor. 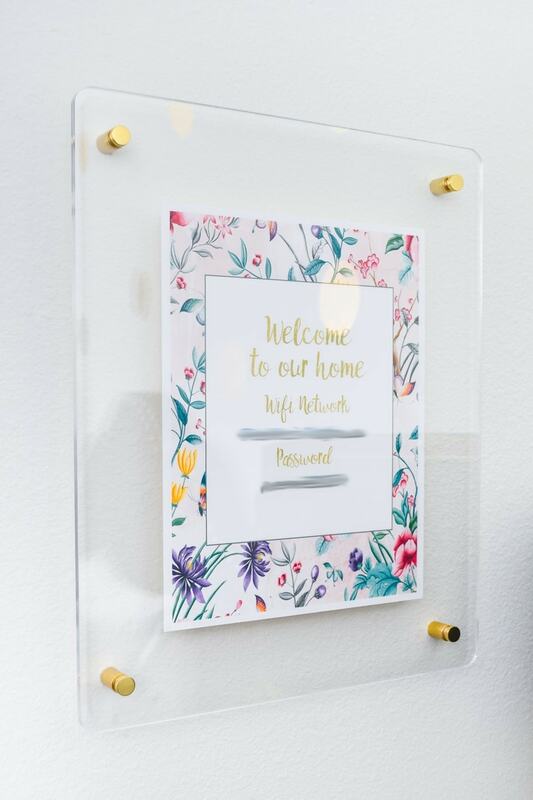 My other Art to Frame piece is a floating acrylic frame holding the wifi password for guests. May as well do it in style, right? 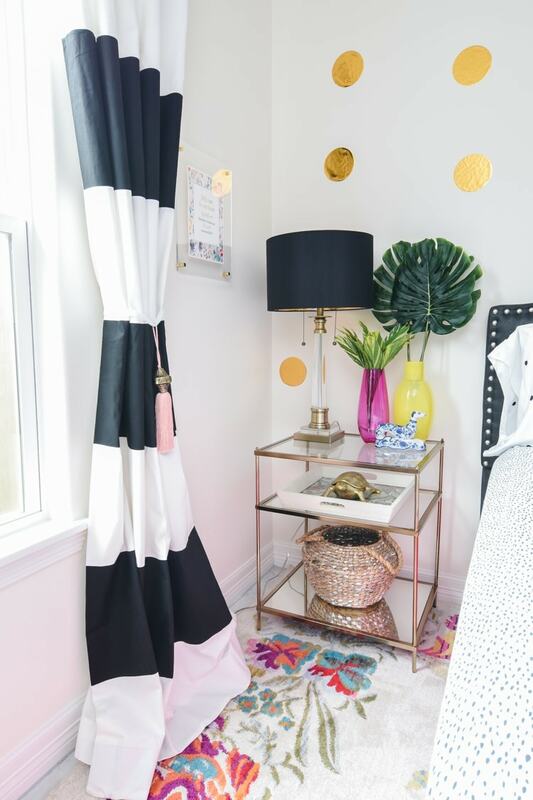 Black and white horizontal striped curtains with oversized pink tassels from Boho Luxe Home add in some drama and help blackout light. 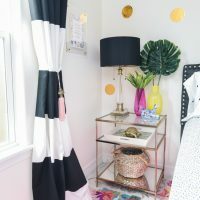 Overall, this guest bedroom decor and space came out so much better than I could have imagined. I am smitten with every bit of the guest bedroom decor. 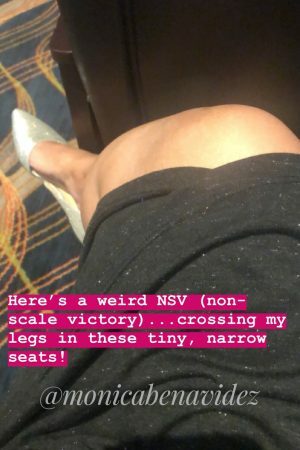 The other NYNR challenge participants are also sharing their reveals, and I KNOW those girls always knock it out of the park so give them some love. 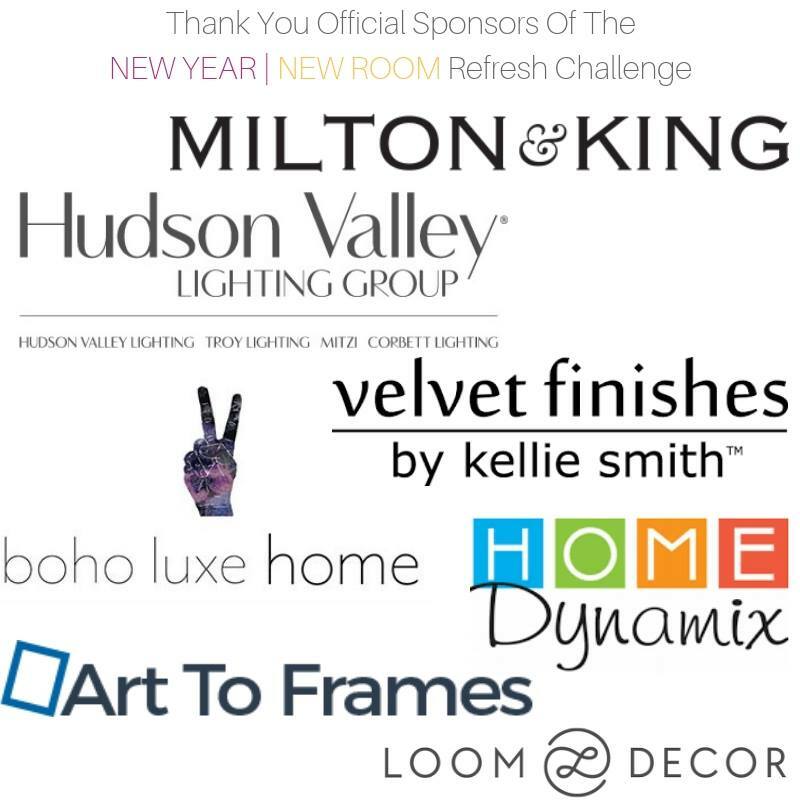 A sincere and very huge thank you to our sponsors for this challenge! The room is fab!!! I’m sorry if I missed it somewhere but where are your gorgeous marble floor tiles from??? They are amazing! Hi there! It is porcelain, marble look tile from Home Depot. There are waaaaay too many ridiculously gorgeous elements to comment on in here – it would take all day!!! A few things though…That light was made for you. 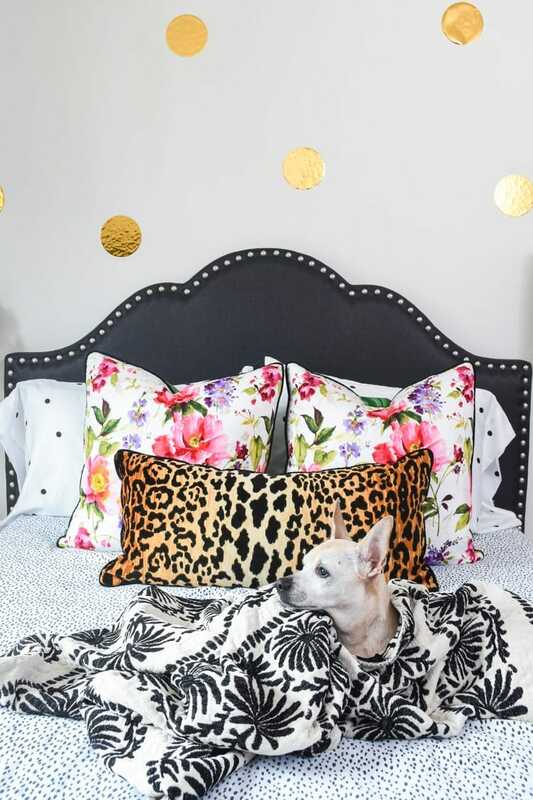 The pattern play of the pillows on the bed is divine. And that hot pink bed skirt is so much fun! I truly love it all. Congratulations on another beautifully completed space! I love it, Monica! 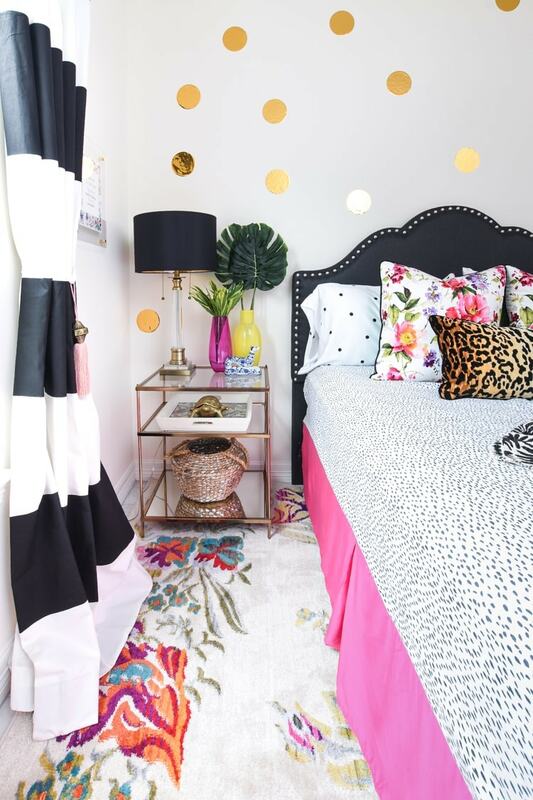 You always mix color and pattern so well! 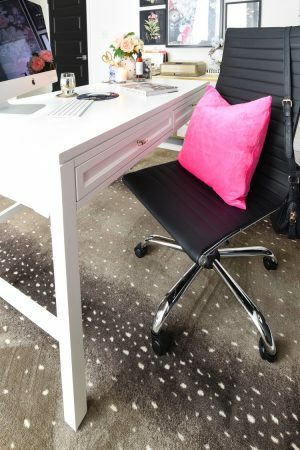 I can immediately pick up on the Kate Spade inspiration, and bet any guest in this space is going to feel like they are in a luxury hotel. Oh, and I’m quickly learning what it’s like to have a pup in all my pictures too. My little one wont let me out of his sight, so he was all over my room when I was taking photos. Absolutely colorful and amazing Monica. 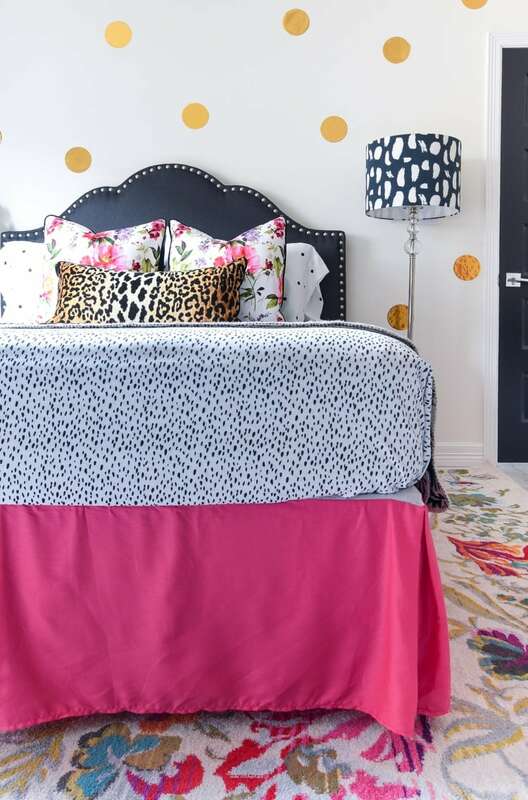 I love how you mixed all those patterns and colors. Just so beautiful! Good to see you! ‘been missing you. LOVE the rug!! SO fun Monica! Love your bright and cheerful colors!! 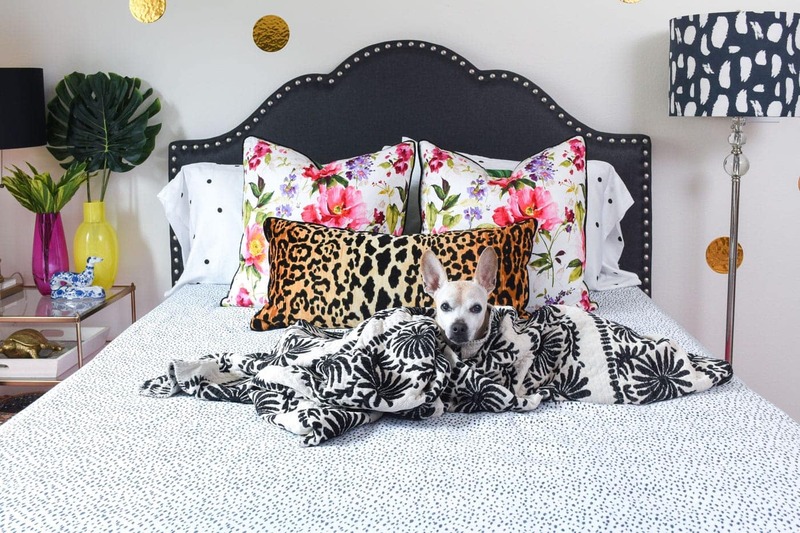 Those floral pillows are everything and Pee Wee is like a prince in this fab room! 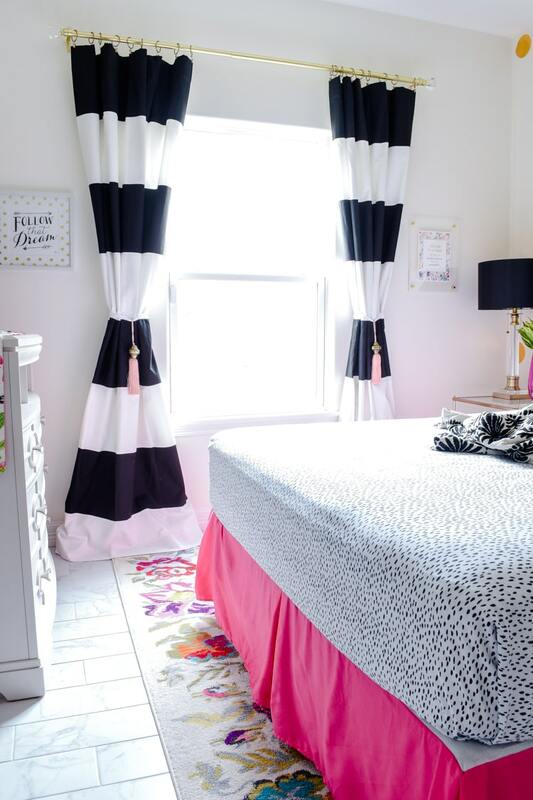 Cute, cute room!!! 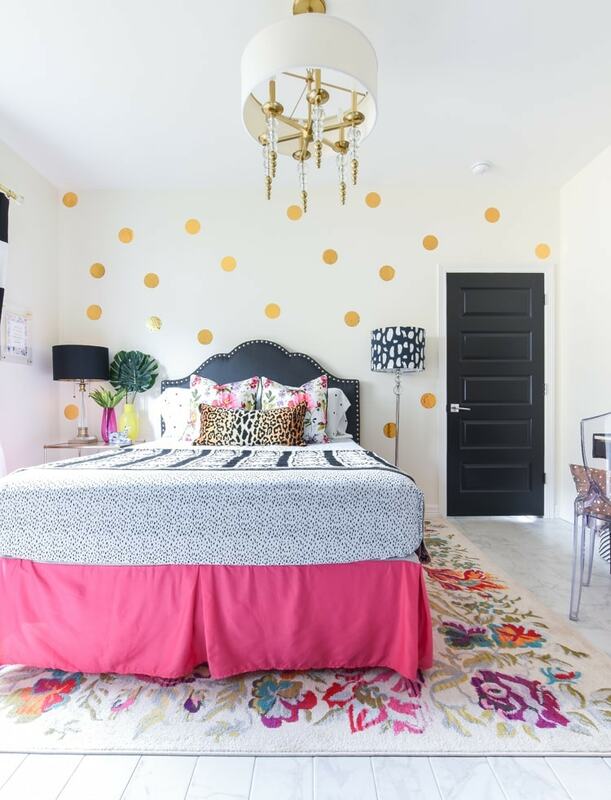 Your guests will be thrilled to stay in this cheerful and fun space. And that light fixture! Gahhhh!!! Book my reservation!!! This is one happy room!!! I love the desk area! Great job Monica!! Also, your pillow game is fire!!!! what a fun room, monica! i love that rug you chose- it’s just perfect! It’s so gorgeous and colorful! Love how bold it is. Congrats, looks great! I love the pretty colors Monica!!! I also really like the desk area. What a fun design.